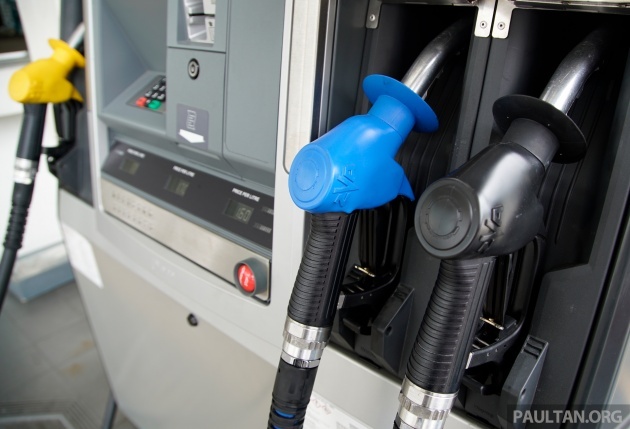 The government says that the price of RON 95 and diesel will be fixed, but that of RON 97 will follow market prices. Prime minister Tun Dr Mahathir Mohamad made the announcement at a press conference following a Cabinet meeting that was held earlier today. This means that RON 95 petrol will remain priced at RM2.20 per litre and Euro 2M diesel at RM2.18 per litre, while Euro 5 diesel will be priced at RM2.28 per litre. As for RON 97 petrol, it is currently priced at RM2.47 per litre – it was not stated when revisions based on market prices for the fuel will begin. Keep in mind that the price of RON 97 is currently GST-inclusive, and could be priced at RM2.33 per litre without GST, barring further announcements made by the government. The last time there was a change in fuel prices was during the fourth week of March, which saw a 10 sen increase across all fuel types and grades. On May 17, Tun Mahathir announced that the weekly fuel price adjustment system, in place since March 2017, would be discontinued, stating that weekly price changes were not good for both petrol station operators and the public. Eh, what happen to Manifesto wanna fix petrol prices at Rm1.50 for eternity? Alredi mudah lupa kah? U can search thru all the PH propaganda. Its pounded again and again they promised Rm1.50. Stop trying to vainly justify their broken promises. Raya coming. Kangkung no more RM1.50/peket. Ini sarahan new Gov. John,why dont u ask your former idol,the current price of kangkung? due to wet season,it is shooting up whether got gst or not. HIGH TIME,u enrol in a course in UNREVERSE PSYCHOLOGY. Stupid john. That was when world price was usd40/barrel and so it was making sense to pricr at 1.50/litre. Today world price is back to norm of USD 70/barrel. Oh now u pipu said its due to higher world oil prices kah? So meaning from Nov until March every week hentam oil price change is just wayang to tipu rakyat lah? then why before u complaint n angry when ron95 price going up? some pipu before even say we are oil producing country so price should be low.. not apply anymore? Suddenly the mantra “Malaysia is rich with oil, we export oil, why don’t we have cheaper oil like Brunei, etc…” disappear. Gone those ‘rakyat’ that terhimpit because of the oil price… they have been educated that external factors do affect the local oil pricing..
Really #MalaysiaBaru, ‘rakyat’ way of thinking already rationalized!! Kudos!!! Price no change, Kerajaan prihatin..
Fuel price no change, car price?? Mana janji Rm1.50 per liter? Prihatin ptui! Lucky we have a clean Government. Otherwise, our petrol by now will be RM3 per litre. Kerajaan sangat prihatin. Despite 1 trillion hutang, kerajaan care for the rakyat. There will be a moment when both have the same price later. Can Tun M just fixed it to RM2? what is the latest price if without GST..?? Today petrol ron97 is priced at 2.47/liter. Gst not deducted. The staff refused when i requested for 6% gst deduction. Within 5 years with the change of new government, Malaysia’s ringgit will strengthen to RM1 = SGD3. All malaysians working in Singapore will be longing to come back. you smokin some good stuff… share some bruh!!! This is GOOD news for Rakyat in general who use Ron 95 & Diesel. As for those who can afford Ron 97 or higher, please do not complain as U have a choice to use Ron 95 if U wanted to. TQVM Harapan. I use RON97 because its a significantly cleaner fuel and beneficial for not only your health, but for your children and your children’s children. do you know what RON is? I think he’s referring to the fact that the 97 in Malaysia is Euro 4, unlike the 95 which is still stuck at Euro 2M. Malaysian government has committed to upgrade RON96 petrol to Euro4 by September 2018. This actually has been delayed afew times (so Sept 2018 is the latest deadline). Let see if this will be realised or delayed again. Oh dear. In this day and age who still subsidise fuel apart for low income country like Congo or some other African countries. Malaysia going backward. X turun pun x apa rakyat faham keadaan kerajaan Sekarang.. At least bagi breakdown the actual price… Kalau kerajaan ikhlas, transparency.. Apa Salahnya Nak bagi tau Kpd rakyat. Rakyat vote for transparency NOT vote for hidden. Rakyat vote utk transparent. Kalau janji xtunai maka xtransparent lettew. Ini mcm janji mau kawin, lepas main kata xjadik. Ingat kami bodoh ke? Change from one Devil to another Devil. These politicians are mostly the same, a bunch of liars. So easy to make promises n give excuses. Problem is, previous really tunai janji but this new older devil lupa janji! Weekly price adjustment is not good for rakyat and petrol pump operators? The few rich people who operate petrol pump needs protection? For te rakyat it’s good to see the price going down. Malaysia has no money to pay is debts but willing to subsidise petrol? Huh? government is trying it’s level best to stabilize the country,please don’t blame them,appreciate what they are doing,it’s not an easy job.. .